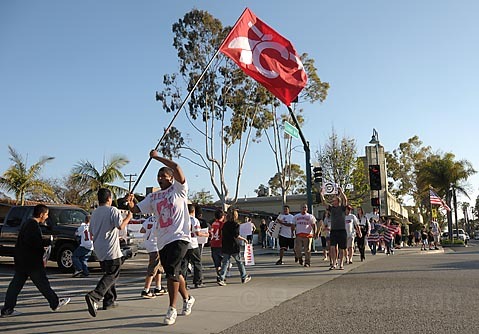 This Friday evening the four corners of Linden Ave. and Carpinteria St. were taken over by protestors that would rather recall the school board members that voted to remove all native american imagery from the high school, then lose their historical logos. Amidst a cacophony of cheers and honking horns Friday afternoon, dozens of Carpinteria High school students and alumni crowded onto the corners of Linden and Carpinteria Avenues to protest the school board’s recent decision to remove all Native American images and icons from school property. Others such as Carpinteria High junior Emily Moorehouse expressed the same frustration with the school board, accusing the board of having made up its mind before the students could present their case. Moorehouse helped coordinate the students in their protest and says they plan to continue protesting every week until the board considers another vote. Mark Jenkins, a senior, said the mood at school has been intense this last week. “Everyone was together on this cause we’re all Warriors,” he explained. He said the group plans to go the Chumash chief to ask for his assistance and support in the matter. Eric Stein, senior and captain of the football team, said the teachers and city council are fully behind the students who want to keep the emblem. “What makes one person’s opinion worth more than the rest of the town?” he asked. “Honoring our ancestors” is a key element of the dispute, said Richard Cervantes, a Chumash Indian and a 1989 graduate of Carpinteria High. Brandishing a tattoo of Chief Joseph on one arm and a tattoo of a Hopi Kachina doll on the other, Cervantes is no stranger to Native American imagery. “They’re not just taking away an emblem; they’re taking away our tradition,” he said. L to R Gayle and Claire Haider, who support the Cordero family, discuss the issue of native american icon removal with Carpenteria high-schoolers Tim and Mark Jenkins. 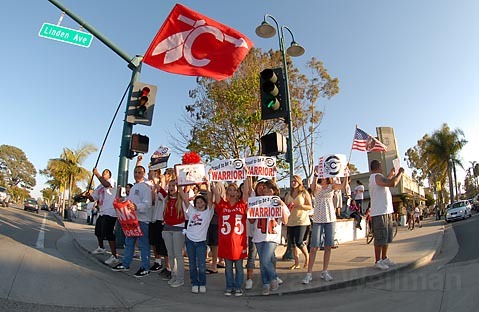 Waving signs and sporting school colors like letterman jackets or even vintage band uniforms, the crowd was a mix of all ages and backgrounds. But not all the signs were in support of keeping the emblem. “Respect People” read the sign held by Gayle Haider and her daughter Claire, an alumnus. “You can have school pride and still be inclusive of other people,” said Gayle. Standing a few feet away from the protest, the Haiders said they felt some balance should be represented. “Just because they’re loud doesn’t make them right,” said Claire.